DALLAS–The Packers rallied for a rousing win over the Cowboys, 37-36, at AT&T Stadium on Sunday. The win keeps the Packers in the thick of the NFC North and NFL playoffs races. Matt Flynn threw an 11-yard touchdown pass to James Starks to start the fourth quarter, and the Packers had cut a 26-3 halftime deficit to 29-24 with just under 13 minutes to play in regulation. Tramon Williams followed with what was initially ruled to have been an interception, and Williams’ return put the ball at the Cowboys 8-yard line, but the interception was overturned by replay review. A DeMarco Murray run and a facemask penalty on Brad Jones gave the Cowboys a first down near midfield. Romo followed with a 27-yard pass to Jason Witten to the Packers 24, and then Romo threw to Terrance Williams for 12 yards and a first down at the Packers 11. Romo’s 5-yard touchdown pass to Dez Bryant with 7:55 to play gave the Cowboys a 36-24 lead. In the Packers’ ensuing possession, Flynn moved the Packers to midfield with a clutch third-down completion to Andrew Quarless. Eddie Lacy broke loose for a 10-yard run to the Cowboys’ 34. Two plays later, Flynn completed a back-shoulder throw to Jarrett Boykin for 27 yards to the Cowboys 7-yard line. A 3-yard touchdown pass to James Jones cut the Cowboys’ lead to 36-31 and put the game squarely in the hands of the Packers defense with 4:17 to play in regulation. Romo underthrew a deep ball for Bryant. On second-and-10, Romo was sacked. Now came the most critical defensive play of the game for the Packers. On third-and-12, Romo completed a 13-yard pass to Bryant for a first down. The Packers spent a time out with 2:58 to play and then Sam Shields made the defensive play of the game for the Packers, intercepting a Romo pass at the 50-yard line. Flynn threw to Quarless for 18 yards and a first down at the Cowboys 32-yard line. With two minutes to play, the Packers were second-and-6 at the Cowboys 28-yard line. Lacy pounded out a first down at the 21, and then the Cowboys were called for pass interference at their 13. Lacy thundered to the 4-yard line. Flynn threw incomplete for Jones on second down. On third down, Lacy rushed for a first down at the 1-yard line. The Packers were now in control of the clock. The Packers scored the go-ahead touchdown on a 1-yard plunge by Lacy with 1:31 to play in regulation. Flynn threw incomplete on the two-point try and the Packers defense had a 37-36 lead to protect. Dallas began at its 20. Romo threw for 9, but replay review ruled Tramon Williams to have intercepted Romo’s next pass, and the Packers’ comeback was complete. The win leaves the Packers 7-6-1 and hot on the heels of Chicago and Detroit in the NFC North title race. DALLAS–The Packers scored a couple of touchdowns in the third quarter and cut the Cowboys’ lead to 29-17 heading into the final quarter of action at At&T Stadium on Sunday. Eddie Lacy exploded for a 60-yard run on the first play of the second half, and Matt Flynn followed with a 13-yard touchdown pass to Jordy Nelson that cut the Cowboys’ lead to 26-10 with 13:08 to play in the third quarter. With a comeback threat at hand, the Packers defense allowed the Cowboys to chew up 6:35 of the clock en route to a 50-yard field goal by Dan Bailey that extended the Cowboys’ lead to 29-10. The drive used 11 plays. The Packers offense then responded with a long scoring drive that featured a fingertip grab by Jordy Nelson. Flynn completed a 3-yard touchdown pass to Andrew Quarless that cut the Cowboys’ lead to 29-17 with 1:09 to play in the third quarter. Green Bay quickly got the ball back when the defense pitched a three-and-out that featured a sack on third down. The Cowboys had yet to convert a third down when the third quarter ended. Following a Cowboys punt and a 26-yard return by Micah Hyde, the Packers had the ball at the Cowboys 22-yard line. The quarter ended with the Packers second-and-13 at the Cowboys 25. DALLAS — The Cowboys piled up 17 first downs and 332 yards, without a third-down conversion, in taking a 26-3 lead at intermission at AT&T Stadium. The Cowboys, who led 13-3 after one quarter, added to their lead with a 48-yard drive for a field goal. Passes of 20 yards to WR Miles Austin and 13 yards to TE Jason Witten got Dallas into scoring range. But a deep ball for WR Dez Bryant was just out of reach in the end zone, and QB Tony Romo was flushed from the pocket on third down, forcing another incompletion. K Dan Bailey’s 43-yard FG, his third of the game, gave the Cowboys a 16-3 lead with 5:54 left in the half. Dallas then got the first turnover of the game, as CB Sterling Moore intercepted QB Matt Flynn and returned it 21 yards to the Green Bay 20-yard line. The Packers defense held, however, getting a sack on second down from DT Mike Daniels before CB Jarrett Bush broke up a deep pass on third down intended for Witten, leading to a 50-yard FG by Bailey for a 19-3 lead. Dallas got the ball once more before halftime and cashed in. A 37-yard pass to Bryant, followed by a 15-yard pass to Austin and a 16-yard pass to Bryant made it first-and-goal on the 1. RB DeMarco Murray ran it in from there to make it 26-3 with 24 seconds left in the half. DALLAS–The Cowboys held a 13-3 lead over the Packers through one quarter of play at AT&T Stadium on Sunday. The Cowboys had the first possession of the game and began at their 19-yard line. The home team quickly moved to the Green Bay 30-yard line. That’s were the Packers defense dug in. On third-and-9, Micah Hyde broke up a pass intended for Miles Austin. That brought in kicker Dan Bailey, who booted a 47-yard field goal. Green Bay burst out of the gate on a pass from Matt Flynn to James Jones that gained 39 yards to the Cowboys 37-yard line. On third-and-6, Flynn was sacked by Orlando Scandrick. Coach Mike McCarthy aggressively ordered a 57-yard field goal attempt by Mason Crosby and Crosby tied the score, 3-3. On Dallas’ next possession, DeMarco Murray broke loose for a 41-yard run to the Packers 31-yard line, and then Tony Romo completed a pass to Dez Bryant that gained 22 yards to the 9-yard line. On third-and-goal from the 5, Romo threw incomplete for Jason Witten, forcing another field goal by Bailey. A 48-yard punt by Tim Masthay got the Packers out of a tough spot, but the Cowboys immediately went to work, as Romo completed a 15-yard pass to the 50. The Packers defense continued to yield yardage in big chunks. On third-and-1, Murray gained 16 to the Packers 25. One play later, Romo hit Witten down the left seam for a touchdown. The drive went 65 yards in four plays. The Cowboys gained 192 yards of offense in the first quarter. The following players have been declared as inactive for this afternoon’s game between the Green Bay Packers and the Dallas Cowboys at AT&T Stadium. 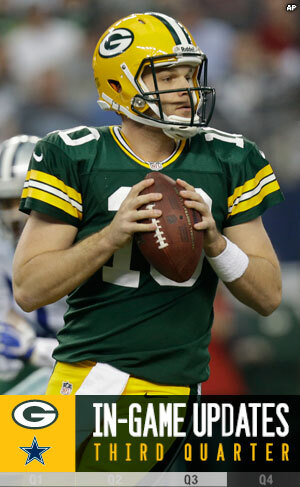 10 QB Matt Flynn will start for Rodgers. 32 CB Orlando Scandrick starts for Claiborne, LB 52 Justin Durant moves from strong side to middle to start for Lee, 51 Kyle Wilber takes Durant’s normal strong-side spot, and 59 LB Ernie Sims starts for Carter. – Green Bay’s 5,128 yards this season (394.5 per game, No. 5 in the NFL) are the second most by the team through 13 games in franchise history, trailing only the 5,254 yards posted in the first 13 games in 2011. – The Packers have posted at least 300 yards of total offense in 15 of their last 16 regular-season games. – Green Bay has a record of 19-9 (.679) in indoor games since 2006 (including playoffs). That ranks No. 2 in the NFL among teams with 10 or more road/neutral indoor games over that span behind only the N.Y. Jets (8-2, .800). – Starting with their victory at Atlanta in a 2010 NFC Divisional playoff contest, the Packers have won nine of their last 12 games played indoors. – Green Bay has had at least one 100-yard receiver in eight of 13 games this season and is tied for No. 2 in the NFL with 10 100-yard receivers on the season. The Packers need one more 100-yard receiver to tie the single-season team record set in 1995 (11). – The Packers are tied for No. 4 in the NFL with 59 plays of 20-plus yards this season. – Green Bay needs 10 points outside of the red zone for its seventh straight 100-point season as far as scoring outside of the red zone. The Packers and Cowboys are tied for the NFL lead with six consecutive 100-point seasons (2007-12). – Green Bay’s defense has recorded 15 sacks over the last five games, which is tied for No. 3 in the NFL over that span. – The Packers have posted six takeaways in their last two games, which is tied for No. 2 in the NFL over that span behind only Tampa Bay (seven). – Green Bay has allowed its opponents to score TDs on nine of its last 23 red-zone trips, a 39.1 conversion percentage that ranks No. 5 in the league since Week 9. – The Packers have committed 4.0 penalties per game since Week 8, which is tied with New England for the best mark in the NFL over that span. – RB Eddie Lacy has rushed for 836 yards over the last nine games, which ranks No. 3 in the NFL over that span. – Lacy needs 113 rushing yards to become the second rookie in franchise history (John Brockington, 1,105 in 1971) to reach the 1,000-yard rushing mark. – WR Jordy Nelson needs two receptions to set a new career high for catches in a season (68 in 2011). – Nelson is tied for the NFL lead with 15 catches of 25-plus yards this season. That is one shy of the top mark by a Packer since 1994 (Nelson, 16 in 2011; Greg Jennings, 16 in 2010). – LB Clay Matthews needs 1.5 sacks to hit the 50-sack mark for his career. He is looking to become the fifth player in team annals (since 1982) to register 50 career sacks in a Green Bay uniform (DE Kabeer Gbaja-Biamila, DE Reggie White, LB Tim Harris, DE/LB Aaron Kampman). – K Mason Crosby has made at least one FG in 12 consecutive games, which ties his career long (2007) and is tied for No. 3 in franchise history behind only Ryan Longwell’s streaks of 15 games (2004-05) and 14 games (1997-98). – P Tim Masthay has placed 13 punts inside the 20-yard line in the last six games, which is tied for No. 3 in the league over that span. Masthay’s net punting average of 41.1 yards over the last five games ranks No. 8 in the league over that span. – CB Micah Hyde has posted 254 yards on punt returns this season, 38 yards shy of moving into the top three in franchise history for the most punt return yards in a season by a rookie. Veryl Switzer holds the franchise record with 306 yards in 1954, with Randall Cobb (295 in 2011) and Antonio Freeman (292 in 1995) rounding out the top three. – Green Bay (6-6-1) will take on the Dallas Cowboys (7-6) today at AT&T Stadium, the first meeting between the clubs at Dallas since a Week 13 matchup in 2007 at Texas Stadium. – The Packers are currently third in the NFC North after improving to 6-6-1 on the season with a 22-21 win over Atlanta at Lambeau Field last Sunday. Green Bay trails the Detroit Lions (7-6) and the Chicago Bears (7-6) with three games remaining. – Including today’s game, the last seven meetings between the Packers and Cowboys (1999, 2004, 2007-10) have been either a late-afternoon tilt or a prime-time matchup. – This will be the first meeting between the teams since a Week 9 matchup in 2010 at Lambeau Field, a 45-7 Green Bay win. The Packers have won the last two games against the Cowboys (2009-10). – The 2010 contest capped off a stretch of four straight seasons (2007-10) where the Packers and Cowboys met. 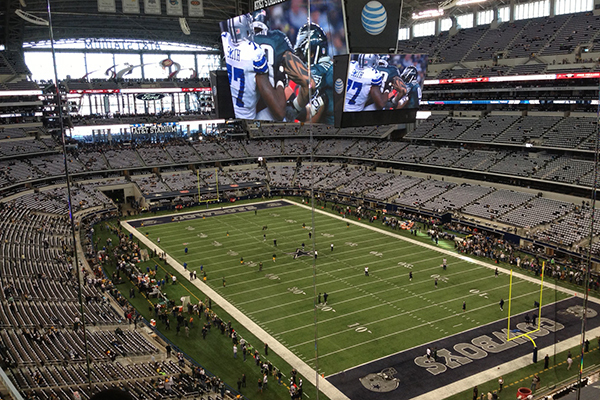 – Today will mark the Packers’ first game against the Cowboys at AT&T Stadium, which opened in 2009. Green Bay played the Pittsburgh Steelers at the stadium in Super Bowl XLV, then known as Cowboys Stadium, on Feb. 6, 2011. – This will be only the third visit to Dallas for the Packers over the past 17 seasons (1997-2013). Green Bay will be looking to win its first game in Dallas against the Cowboys since a 20-10 win at Texas Stadium on Christmas Eve in 1989. – That 1989 contest is the only other regular-season meeting between the clubs in Dallas in December/January. – The Packers and Cowboys represent two of the proudest and most successful clubs in the NFL. The teams have combined for 18 NFL championships (Green Bay 13, Dallas 5) and nine Super Bowl titles (Green Bay 4, Dallas 5). – Green Bay topped the Cowboys, 34-27, in the 1966 NFL Championship in Dallas on its way to winning Super Bowl I vs. Kansas City. – After Vince Lombardi and Tom Landry turned it into one of the league’s great rivalries, the Packers-Cowboys series reached another peak in the 1990s with some memorable playoff battles. – Though the Cowboys have won 11 of the last 15 overall meetings, the all-time regular-season series is deadlocked at 12-12. – Since 2009, the Packers have a 16-5 (.762) overall record in December/January, which ranks No. 2 in the NFL over that span behind only New England (19-3, .864). – Green Bay enters today’s game with a 34-12-1 record over their last 47 regular-season games, a .734 winning percentage that is tied for No. 2 in the NFL over that span (with San Francisco, 34-12-1) behind only New England (37-10, .787). – Today’s officiating crew includes referee Walt Coleman (65), umpire Roy Ellison (81), head linesman Jerry Bergman (91), line judge Rusty Baynes (59), field judge Greg Gautreaux (80), side judge Rick Patterson (15) and back judge Greg Yette (38).